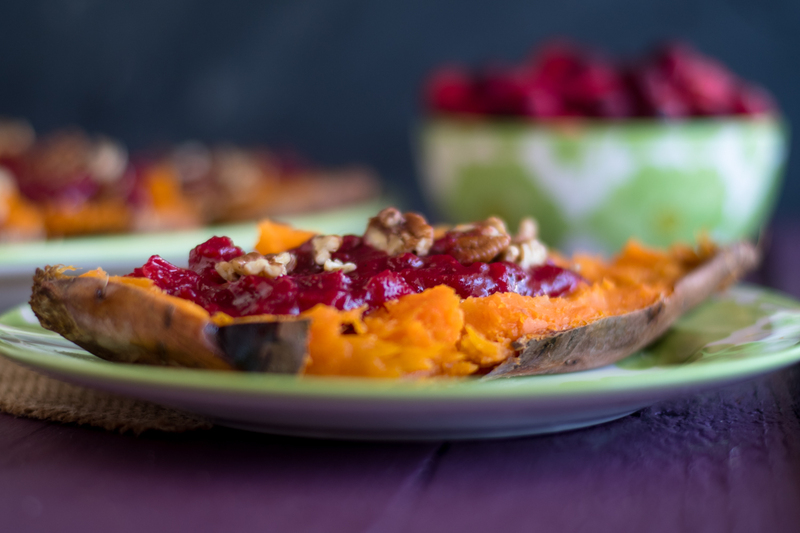 Cranberry Stuffed Sweet Potatoes combine two holiday side dishes in one! Since visiting the cranberry harvest a few weeks ago, I have been cranberry obsessed. 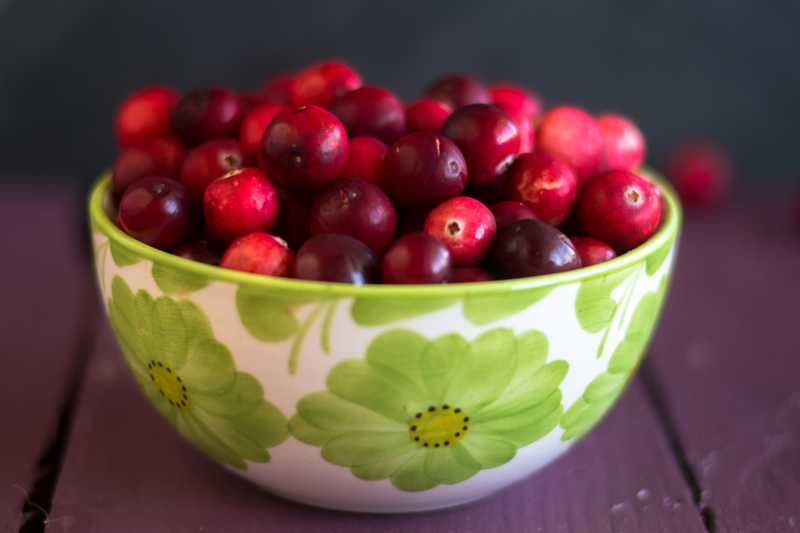 I have been looking for new creative ways to use cranberries. Two of my favorite dishes on Thanksgiving are sweet potatoes and cranberry sauce. I thought way not combine to two dishes into one and make Cranberry Stuffed Sweet Potatoes! While the sweet potatoes are baking in the oven, the cranberry sauce is made on the stove top. This sauce is so easy to make and isn’t too sweet. I also like to add apple cider to the sauce to add a touch of natural sweetness. I do use a little bit of pure maple syrup in the sauce. I use just enough so the sauce doesn’t taste overly sweet. 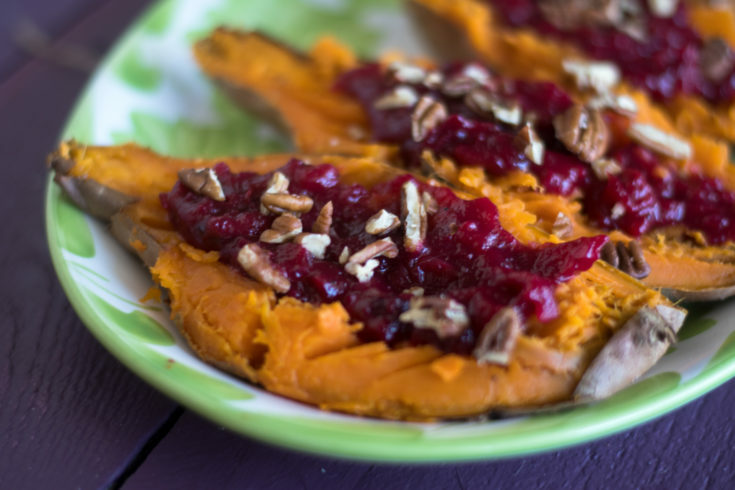 The combination of the sweet potato with the cranberry sauce is a little bit sweet and tart. The two compliment each other so well. Once the sweet potatoes are done baking, I let them cool a few minutes before cutting in half. Each sweet potato half gets topped with some of the cranberry sauce. For some added crunch and texture, the sweet potatoes are topped with chopped pecans. These Cranberry Stuffed Sweet Potatoes are an easy dish dish for the holidays or for a weeknight dinner. I also enjoyed the leftovers for breakfast the next day. They are naturally vegan and gluten-free too! 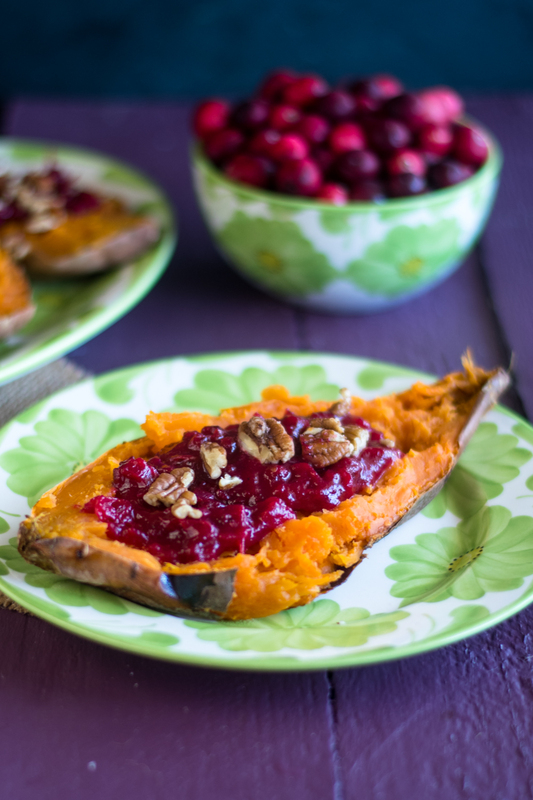 Cranberry Stuffed Sweet Potatoes combine two holiday side dishes in one! Baked sweet potatoes are topped with an easy to make cranberry sauce. Poke each sweet potato with a fork a few times. Place on a parchment lined cookie sheet and bake 1 hour, or until tender. Meanwhile, make the cranberry sauce. In a medium saucepan, heat the oil over medium high heat. Add the shallot and cook 2 minutes, stirring occasionally. Add in the cranberries, maple syrup, apple cider, salt and pepper. Bring to a boil. Reduce heat to a simmer; cook for 15-20 minutes, stirring occasionally. When the sweet potatoes are cool enough to handle, cut each potato lengthwise in half. I think to take a fork and slightly mash the top of the potato. Top each half with some of the cranberry mixture. Garnish with the chopped pecans.